Are you unhappy with the appearance of your skin? Does it have an unpleasant texture, or do you have uneven skin tone? Skin rejuvenation is a treatment to improve the overall appearance of your skin, and it can work wonders on a host of problems. This procedure can make your skin smoother, shrink enlarged pores, even out skin tone, brighten the skin and reduce hyperpigmentation, clear acne, smooth scars, smooth lines and wrinkles, tighten the skin, and make your skin softer to the touch. At Natural Foundations, we use four different advanced devices for skin rejuvenation. We will recommend the best one for you based on the condition of your skin and what you wish to achieve. Each technology has its own talents and special properties. The Venus Legacy device use NanoFractional Radio Frequency and SmartScan technology, as well as pulsed magnetic fields, to rejuvenate the skin. It also combines VariPulse™ technology with 3D™ MP2 energy to give you a deeper treatment that stimulates circulation and immediately plumps your skin, improves texture, and evens out skin tone. After just 3 treatments, you should begin to see some results. Most people get about 6 treatments on the face once a week, and each treatment lasts less than a half hour. Venus Legacy is not painful; it merely feels like a hot pulsing massage on the face. Most patients experience facial redness for about an hour after the treatment. The Venus Viva device is a “fractional” laser that targets only the damaged skin, leaving the surrounding skin untouched, allowing for a faster recovery. Besides improving the overall appearance of your skin, Venus Viva is an effective treatment for many acne and injury scars. Most patients need at least 3-4 Venus Viva treatments every 2 weeks, although this can vary depending upon what you wish to treat and the severity of the problem. We apply a numbing cream to your skin a half hour before the Venus Viva Laser device is passed over your skin. The treatment itself takes less than a half hour and will smooth your skin, even out tone, and improve the overall appearance of your face. No downtime is required after Venus Viva, but you might experience some redness and discomfort similar to a mild sunburn. This does not usually last for more than a day and a half. Your skin will be more prone to sunburn after your treatment, so please use sunscreen when outdoors. We can recommend skin care products to speed healing. Microcurrent treatment is a non-invasive procedure that rejuvenates the skin by smoothing wrinkles, improving texture, and evening out skin tone. It promotes collagen and elastin production, while also increasing blood circulation and cell regeneration, for an overall more youthful and beautiful look. During a Microcurrent treatment, a tiny electrical current is administered through two Q-tipped probes and applied to the skin, but the skin is not harmed during the process. The sensation is merely a gentle tingle. The Regenlite laser is our most versatile device, which has the ability to rejuvenate the skin in so many ways, including the treatment of acne. It stimulates collagen and elastin production so that you will look better naturally and gradually over a period of months. It is gentle and non-ablative, so it doesn’t burn the skin and doesn’t require any downtime. Regenlite treatments are simple. Wearing protective glasses, the operator moves the SmartPulse hand piece slowly over the eye area. You will also wear protective eyewear to protect you from the light of the laser. During your treatment, the hand piece is held close to your skin, but it is not painful. Most patients report a slight warming sensation. Your treatment should take no longer than 30-45 minutes. You might experience some slight bruising in the treated areas for a day or two, but otherwise, there are no side effects. 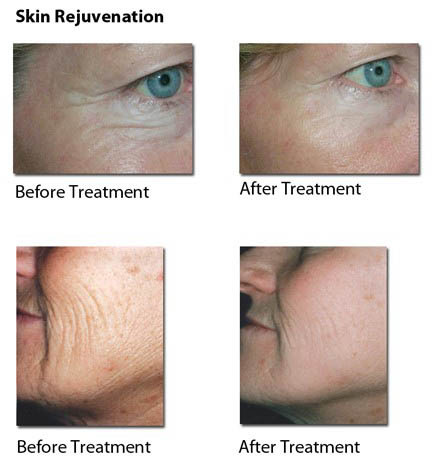 Most people require a series of treatments every other week for optimal skin rejuvenation results. If you are ready to get started with Skin Rejuvenation treatment, call Natural Foundations in Capitola at (831) 325-0202. Call now for a complimentary consultation.